County Executive Chris Abele speaks as a press conference in 2014. Photo by Jeramey Jannene. It was back in late January that Gov. Scott Walker, already getting diverted from state issues by his aggressive run for president, announced the state would issue $220 million in bonds to pay for a new Bucks arena. Walker had just won election as governor for the third time in four years, had repeatedly shown great deftness in framing issues to his advantage and doubtless had supreme confidence in his ability to sell voters on this issue. As Walker explained it, the deal involved “no new taxes” and “absolute security for the taxpayers” because the $220 million in bonds would be recouped through new state income taxes paid by Bucks ballplayers, whose average salary would rise significantly in future years due to a lucrative new TV contract signed by the NBA. Indeed it was. As it became clear the total cost of the bonds, with interest, would amount to $380 million, the numbers showed the state would be paying 88 percent of the total public costs for a Milwaukee-based facility that would benefit three Bucks owners whose combined net worth exceeded $5 billion and the Bucks ballplayers whose average salary was nearly $4 million. Imagine trying to sell that to your constituents if you’re the average Republican legislator, almost all with districts outside the city of Milwaukee, a place that many GOP legislators routinely demonize. Polls showed citizens outside the Democratic redoubts of Milwaukee and Madison opposed giving state help for an arena by an astounding 86 percent to 10 percent, as Steven Walters has reported. Walker had put Republican legislators in an impossible position and Republican Assembly Speaker Robin Vos and Republican Senate Majority Leader Scott Fitzgerald soon began making statements saying Milwaukee must contribute more. Barrett responded with a statement praising Walker’s plan. By early April, Fitzgerald had released a plan that would reduce the state contribution to $150 million (plus interest), which seemed to mean the city and county had to come up with at least $100 million. Barrett again responded with praise for Walker’s plan, while adding that he appreciated Fitzgerald’s contribution to the discussion. The situation was rife with irony. Here was Walker’s bitterest opponent, Barrett, beaten twice in gubernatorial races, heaping praise on the governor’s plan, and watching the Republicans squirm over the political hot potato Walker had handed them. The Republicans had lost the State Senate in the 1990s because they supported the Miller Park subsidy, as George Petak was recalled from office, and now they faced a problem that might be just as perilous. Precisely what he worked out is unclear. Abele was the first to mention tapping into the Wisconsin Center District car rental and hotel tax. Abele and city officials, I’m told, agreed on a plan proposing to increase the Wisconsin Center’s tax in order to help pay for the arena and pay for expanding the city’s convention center. But Walker and Vos soon shot that idea down: they wanted no tax increase and didn’t want an expanded convention center as part of the deal. But they soon proposed to use the Wisconsin Center to issue bonds that could be repaid with taxes generated after 2028 (when the center’s tax will begin to generate revenue beyond the construction costs it is currently repaying). 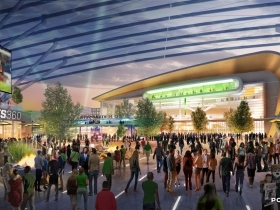 This plan pushes the costs of the arena far into the future, on the backs of local taxpayers (and tourists, who pay a significant percentage of the hotel and car rental taxes). Abele and Barrett both agreed to this plan, which, with interest included, will cost $200 million. But this still wasn’t enough money. By the time this discussion was going on, Vos had made it clear the state wouldn’t contribute more than $55 million (plus an estimated $25 million in interest payments), a reduction of $300 million from Walker’s original offer. But state officials had concocted a clever plan to raise the final $80 million needed to fund the arena: the city and county would certify some of their uncollected debt so the state could collect it. Barrett made it clear he couldn’t support a plan “to collect debt from indigent people to support a $500 million arena,” as one city insider notes. Abele, however, not only agreed, but offered to take on the entire $80 million cost. As for the uncollected county debt that will help pay for the arena, the most detailed estimates to date suggest there is almost no such debt to collect as most of it is actually owed to victims of crimes or is old and uncollectible. No, Bice doesn’t report these details, either. His article leaves you thinking that Abele is the real leader in Milwaukee. “I now think of him as being more like Milwaukee’s mayor than (Barrett),” an unnamed “community leader” told Bice. Bice never notes that the entire negotiating problem was caused by Walker’s boneheaded decision committing the state to pay almost all the public costs. He never questions the unwillingness of Vos and Walker to “be creative” by raising the Wisconsin Center tax to pay for the arena and an expanded convention center. Yet he lets us view state officials positively for unwillingness to spend what Walker committed them to, while portraying Barrett as the bad guy for being concerned about the costs for Milwaukee taxpayers. All of which leaves readers with the idea that Abele is this “creative” guy because, well, he agreed to eat $80 million in payments over 20 years. As I’ve noted, it’s unlikely this will be funded by uncollected debt, and is likely a cover for the state cutting its aid to Milwaukee County. Bice’s story would make a little more sense if he was writing for the Waukesha-Ozaukee-Washington counties — call it the WOW Journal Sentinel — but is stunningly uninformative if the paper still sees itself as also serving its Milwaukee County readers. 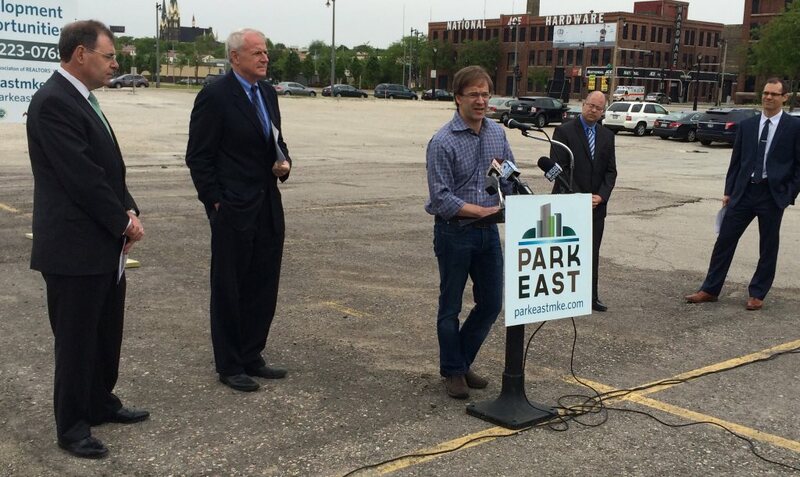 As for Abele’s promise to improve the arena deal to “bring more value” to it, I see no evidence that happened. All the data suggests an NBA arena has little or no economic impact on a city. Adding a provision empowering tougher debt collection won’t help the economy. And Abele’s latest idea, offering county land for $1 to the Bucks for ancillary development, adds insult to injury for taxpayers. If the land is really so hard to develop (and the city’s success developing its portion of Park East land suggests that’s untrue), then why not offer the land to all developers for that price and pick the best proposal? As far as I can tell, Abele’s “can do” approach consists of not negotiating with the Bucks or state officials over anything and simply complying with any idea they suggest. Bice, by the way, has tweeted to complain about the New York Times story on Michael Grebe borrowing from an earlier piece he co-wrote for the Journal Sentinel. In my last column I noted the Times seemed to use information without crediting the JS as the original source, and I’m glad to see Bice now agrees that publications should credit those they borrow from. Abele has always struck me as a Republican who supports gay marriage. As with Clarke, though, it’s better to pretend to be a Democrat to get elected. And you allude to this Bruce but collecting $80 million in debt seems like a completely impossible task. The piss poor reporting on this “deal” in the JS smells like George Stanley. We no longer have a major credible news source in Milwaukee. When I heard state Republicans talking about this deal, they emphasized that the risk was on the county. The state’s $4 million would come off the top of the collections, leaving the county to handle any shortfalls. They’re also charging the county a smaller fee than the private collection service currently employed, which they estimate will save $1 million alone. Honestly, I’m a little surprised that I haven’t heard many comments on how the Republicans are replacing a private business with a government agency because government can do it cheaper and better. Kyle you probably know more about this than I do. Isn’t it going to be hard to collect that amount of debt every year? Sure seems like it but maybe I’m wrong. Both sides of this issue play loose and fast with the numbers they like, so it’s hard to say exactly what is going to happen. State Republicans claim the $4 million for the arena comes first, so the arena won’t be shorted, but that means that the county certainly can be. They also claim that the fees will be lower, so after the savings you only need to find an extra $3 million. What no one seems to know is exactly how that will play out. Either they will fail to collect on it leaving the county to deal with the difference, or they’ll use the ability to garnish wages and seize property to ensure more debts are collected. But, if you believe the nay-sayers when they claim that most of the court fees go to state agencies already, then really any shortfall will come back to the state. (94% goes to state according to http://www.wisn.com/news/milwaukee-county-arena-funds-questioned/33517792) My guess is that the state leans harder on these debts than the county ever did, but still comes up a bit short. It will look promising for a few years while they get the low hanging fruit, but it will be an issue down the road (that someone other than President Walker will have to deal with, maybe Governor Fitzgerald). Don’t you mean Governor Vos? I almost put down Governor Vos, but I figured since there are two prominent Fitzgeralds in the party right now, I had a better chance of being right. Can we at least agree it won’t be Governor Barrett? Ha yes Kyle we can definitely agree on that. I know it’s been mentioned here but not empathized there is little chance the County (and County taxpayers) won’t be left holding the bag. I see a bankrupt County being taken over by the State I’m no conspiracy nut but perhaps this is the intent. I respect the research into realistic costs vs benefits that UM has been doing. It is clear, however, that Murphy’s articles have become increasingly jealous attacks made on the JS. A bitter ax to grind has he. It is an admitted opinion piece, yes, though a little tact would go a long way. They are the largest paper in the state. There’s nothing wrong with someone subjecting them to some scrutiny. Do you not understand the JS’s exposure? reflect investor confidence that Abele’s deal closes? Bruce should change his name to Bruce Belling-Sykes-Murphy since he’s just like them but coming from the left. It’s obvious Bruce wants to try and destroy the deal with his “reporting”. What he doesn’t realize or won’t think past the “not one dime of public money” aspect is it instantly drops the city to Tier 5 or below, stops all momentum the city has all for the name of ideological purity. Haha, you’re so far to the right everything looks left wing. At best Bruce is merely playing the contrarian and asking the questions no one else does, like those old fashioned journalists of yore. At worst, he’s a nitpicking thorn in the side of right wingers, only because he’s trying to have a debate using actual facts. A left winger would be calling for the public to have equity in the team, in return for the public’s investment. Next, a left winger would be calling for a progressive funding mechanism for the subsidy, instead of one of the poorest cities in the state and one of the poorest counties in the state trying to decide if they’ll use their proverbial retirement savings or children’s college savings to fund this deal. Ryan, have you ever heard of the Dunning-Kruger effect? Never attribute to malice that which can be adequately explained by stupidity, but don’t rule out malice. I disagree with your criticism of Bruce. There’s no “momentum” without a lot of folks in southeastern Wisconsin, who can afford the prices the Bucks charge for the “lower bowl.” What does Jeff Bezos pay his warehouse workers? Where are the jobs coming from that the owners of the new arena need to make money? To retain listeners, wingnut radio has to occasionally touch on those areas of agreement with libs. So as not to, “bite the hand that feeds them,” they want to do it as little as possible. They can’t ignore Wisconsin “welfare” for out-of-state billionaires, #carpetbaggers without losing listeners. What other cities want an NBA franchise? Do you understand the ponzi scheme upon which the value of all professional sports franchises are based? Owning an NBA franchise is like owning contemporary art. If you own an Andy Warhol, you know you can’t sell it, until you get a certain price. If you even consider selling it for something that doesn’t improve the value of everyone else’s Warhol, you’re their sworn enemy. Increasingly, if someone buys ellite-priced contemporary art, that’s written into the contract. You really don’t own the art, because you can’t control at what price you sell it. You’re buying into a franchise. Even if it weren’t for Marquette, I’d like the Bucks to stay. If the Bucks leave, it’s a blow to Marquette’s recruiting, which already faces enough headwinds. Anything bad for Marquette is bad for Milwaukee. 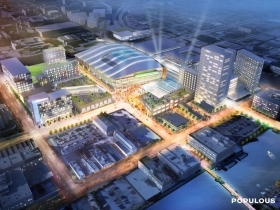 Edens, Lasry, Sen. Kohl, the NBA, and the state could lend the money they’ve pledged to Milwaukee County, who could design, build and own the new arena. I don’t expect that to happen, but it’s an option. As long as the taxpayers aren’t repaid in full, imho the stigma of “welfare” for billionaires will taint Edens, Lasry, the NBA, Marquette, and the pols who supported the deal. I get that there’s some civic benefit to a new arena, but aren’t Edens and Lasry going to have the controlling interest? Isn’t their ownership tainted by any taxpayer support that’s never repaid with interest? Agree with Tim that Bruce is hardly a naysayer for digging up some facts and asking pertinent questions. It turns out this arena deal is being closely scrutinized by major national media as well. Scott Walker & his arena pitching got a double-header today. Many on the right solidly oppose it, even his Koch Brother patrons, as well as anyone who pays attention to all the economic research on sports venues from the past two decades. As with climate science, the facts are getting harder to deny. h/t to Tim for “Dunning-Krueger,” makes sense and I’d never heard of it. Chris Abele is using this arena deal to further his mission of dismantling Milwaukee County government, plain and simple. It’s nice to see Bruce is finally starting to understand Abele. This isn’t the first time the County Executive has tried to use debt collectors to achieve his goals. He tried to collect $35 million in miscalculated pension benefits (County’s fault) that had been paid out over decades from elderly ladies and deceased retirees. Abele is a monster. We have the best network in state. From the very beginning there was almost 100% against Bucks deal. Everyone forgets that the Brewers deal lost statewide referendum, then lost Petak, then Drzewicki on the Green Bay deal and even more important it affected the Welch/Lorge primary. The democrats have been salivating to use that and the K!2 cuts on campaign time. Top people felt we could lose 10 seats, just on that in close districts. So they had to force the dems to also vote on this. But, the opposiiton is so bad out state and even in Metro area as Bucks have few fans, no one believe in the development BS, who needs more bars? so why would we possibly do this. No one has seen the NBA/Bucks contract so it is only their word. Finally these boys want this toy and if they have to give it back they lose their big way into infamy in NY. We did not do good job in forcing the issue, now to give them land for $1? That is really nuts. At same time the dopy County board dumps on NML, our best employee. Wonder why all the businesses and growth is in Waukesha? Tim, can you stop with that poorest city and poorest county nonsense? Milwaukee county is right in the middle of the state for per capita and household income, and the city considers itself an economic engine for the state that subsidizes everyone else. When this arena debate started, I thought Bruce was a refreshing source of information. Now, he just seems obsessed. This article cites 4 other UrbanMilwaukee articles. The information is consistently presented to paint the worst possible picture for the arena, such as claiming it will “cost” the city $450 million in property taxes, despite the fact that this land didn’t produce anything resembling that in the past, and won’t in the future without the arena. Obviously the topic is treating him well and driving discussion and views, but he has reached a point similar to Sykes and Belling: He has to stay on point now to avoid alienating this new fan base. Any positive discussion of the arena would hurt his business. Thanks for all your insightful posts. I’ve been trying to really grasp how this debt certification (factoring) will work. It looks like the vast majority of county “receivables” are unpaid real estate taxes from municipalities other than the City, which collects its own. However, most of those taxes are ultimately collected either through tax foreclosure or through loan work outs, “modifications” where the lender capitalizes the past due amount into the modified principal balance and pays the tax. So, I just don’t see that this plan will actually generate the funds needed. Then what? My other concern is that if the Wisconsin Department of Revenue commences collection activity through tax liens (one of their most powerful tools) the unforeseen, and unintended consequence is that homeowners who are struggling with the mortgage payments will be rendered ineligible for a loan modification under HAMP (the federal loan modification program) and other private bank programs. In the first quarter of 2015, the Metro Milwaukee area saw (Milwaukee-Waukesha-West Allis, WI Metropolitan Statistical Area) 5,793 loan workouts through modifications. If this plan unfolds as described, the likely result will be over 5,000 new foreclosures, ones that could have been prevented. This is complicated, but the simple view is that there are about 250 foreclosure starts in Milwaukee County per month. There are even more people behind on their mortgages unable to refinance because they are underwater on their loans, but not yet in the court foreclosure process. In Q1, 5,000 of those Milwaukee area families got back on track. Their lender capitalized the past due amount back into the loan, and they promised to repay that higher amount. Their interest rate probably decreased to market rates, so their payments are now affordable. Imagine what it will be like with an annual increase foreclosures in Milwaukee county from 3,000 to 20,000? We’ll be back to 2009. This is likely only one of many unintended consequences. Let’s get all of the details and data into the day light, and get the stakeholders’ views, those with the best working knowledge of mechanics and impacts. Walker needs to embrace Capitalism and let the Bucks go. Or tell them if they want a bigger venue, go play in Miller Park. Win-win-win. John Casper, your post is not related to any of comments in any fashion that I can discern. He compared the city and county to the state to counter Tim’s point regarding the same. I don’t see how your links address that at all. I have to agree with Kyle that Bruce has become obsessive at this point and only reinforces his own one sided view. I’ve seen Bruce be very objective on many topics, but this arena line of articles have been quite concerning. I have to agree with Kyle above, Bruce Murphy is just flat out negatively obsessed with the Bucks arena. He is paid based on clicks and eyeballs and this is obviously working for him. So sad. He sounds angry, bitter and mean spirited. Almost gleefully hoping that the Bucks leave Milwaukee. A sad day that will be. So much for “championing urban life” as his blog states. More like “a blog for the urban and cynical and elite”. This is a great town and it can’t afford to lose any more assets, and the Bucks are one of our best assets. Kyle, AG, Allison … What points do you disagree with or think are so biased that led you to the conclusion that he is obsessed with this? The astroturf campaign that the big money is running to support this arena seems to have made its way to this comment section! How does opposing the existing arena plan make someone elite? Is it possible to be somewhere in the middle on this? I’d like to keep the Bucks and have a new arena, but I’m not exactly thrilled about the current plan. Posts like yours Allison make supporters seem just as obsessed and strident as detractors. I do not know anyone that wants Bucks to leave, but do know that about 100% or so, out of Metro area, that do not want to give the bucks a billion dollars. Personally I watch college basketball occasionally and am bored by pro basketball. We all know that all the development, more bars and restaurants, does not help the community. We also know that we are not driving a hard bargain. Supposedly the Bucks must have a new Arena or the Bucks revert to the NBA. No one has seen the contract between the NBA and the Bucks. Can they stay here if we do not build, use the functional Bradley? Most of the big money is now from TV. If we refuse to build, will they put up more of their own money to do it. Maybe all of those that profit from the Bucks, like MMAC, Realtors will put up more. It is hard to convince some farmer in Antigo that he should pay his tax money for something he cares nothing about, in Milwaukee. Finally the moral argument. How can we possibly take money needed for more cops, to teach kids to read and give it to millionaires and billionaires? It is a Nutty idea. To Kyle, AG, Alison: I’m a huge NBA fan and currently thrilled by the finals, which I’m hoping goes 7 games. I love what Jason Kidd has done with the Bucks. And I would be very sorry if Milwaukee loses the Bucks. But I’m opposed to sports subsidies. From an economic development perspective there is no reason to treat them any different than other businesses. And I think these issues are important to air, because they are not elsewhere in the media. Similarly, there was no one looking critically at Miller Park proposal other than me when I was at Milwaukee Magazine, and no one in the media who tallied the total costs (which have continued to rise). If the proposed plan was a limited subsidy, it would be tempting for me to say all good, as I love basketball. But that’s clearly not the case here. I don’t think I made any statement about the health of Wisconsin’s economy or the variety of reasons possible for it. I just refuted that Milwaukee and Milwaukee County are the poorest city and county in the state. They are not. As for the questionable math, I agree that both sides are using very fuzzy numbers to make their case look stronger. I think it’s deceptive to claim that the BC will cost $120 million to keep, just as I think it’s deceptive to claim that the new arena will cost $450 million in lost property taxes. I think that Bruce is obsessed with this because there is a new story bashing the arena every other day. I think citing yourself multiple times is an indication you aren’t really saying anything new. The current owners of the Bucks could easily afford to pay for everything in this plan by themselves. Or they could get other extremely wealthy people to also invest in this plan. They do not NEED public money to build what they want to build. Public polls show that the public are overwhelmingly opposed to providing public funds to the Bucks organization. So when the owners threaten to leave Milwaukee unless the public is taxed to provide funds for this venture, is that not “blackmail?” And when elected officials give in and offer public funds, is that not colluding with this blackmail scheme? Does that not make them accomplices in this theft from the public? When someone points out that the emperor has no clothes, something that is obvious to anyone with eyes to see, we should thank them. Thank you Bruce. The franchise would be worth close to $1 billion if it could relocate. It is valued by Forbes at $600 million in Milwaukee. Sure, they could afford to pay the entire $500 million cost of the arena, but then they’d have put over $1 billion into an investment that will not be valued nearly that high. With the $150 million they have pledged, their investment would be $700 million, well above the current valuation (but presumably not above what they project the value would be with a new arena). I suspect that it just becomes a poor investment if they commit much more, particularly considering the opportunity cost. Middle ground? Quit sounding so reasonable Kyle. For real though a January story puts the local ownership group at 19 members (refers to them as investors). How much are they putting up for this? They did spend a lot of time gathering minority owners to add to their group. I would guess that mostly their investment is minimal (in terms of total ownership of the team), and mostly to demonstrate a commitment to working with local leaders and business and keeping the team in Milwaukee. I used to think that Edens and Lasry would be allowed to move the team if a deal didn’t get done, but their moves to me suggest that they won’t have that opportunity. If nothing gets done, they basically get their money back, and the NBA gets to resell the franchise. So the other NBA owners stand to gain roughly $400 million if Milwaukee doesn’t build a new arena. Hopefully that’s enough leverage to work the deal in such a way that the owners are responsible for any cost overruns and that the taxpayer contribution is finite and defined. I believe you are correct Kyle. “Sources told ESPN.com that the sale agreement announced last week to transfer the Bucks from longtime owner Herb Kohl to Edens and Lasry for a purchase price of $550 million includes a provision that allows the league to buy back the team for $575 million if construction on a new building in Milwaukee is not underway by the deadline.” The deadline being November 2017. Let’s also remember that we’re talking about building an arena, not dumping money straight into an NBA team. An Arena is a public asset. Even if the Bucks are the impetus of a new building, lets remember that it’s a building used by many other entities. There are real costs to not building an arena just like there are for building one and these costs affect a lot more then an NBA team. You can’t weigh subsidies for an arena the same way you would “any other business.” Nor would I view these subsidies the same way I would regarding the Meier festival grounds or the convention center, even if both of those public amenities also benefit for-profit groups. Also, Bill Sweeney, being able to afford something has no bearing on whether someone is willing to pay for something. I can afford to pay full sticker price on a car, that doesn’t mean I would purchase it without a discount and the best trade in value I could get on my current car. That’s right AG, it IS a public asset, which is why the PUBLIC should have input. This deal should not be made behind closed doors by a single uneducated elected leader like Abele. If we had an appointed County Administrator with a college degree (maybe even a graduate degree!) this plan wouldn’t be met with so much skepticism. But Abele has a history of working with Walker to the detriment of Milwaukee County. Would Abele having a degree really make that big of a difference? I agree the public should have input, and I don’t like Abele much, but I don’t see how a degree changes his stance on the deal. Unlike our county board members who clearly listen to their constituents. I’m sorry Abele not having a degree makes you feel he is unqualified to lead the county in this process. Perhaps when he comes up for re-election you can do more to oust him? I think there should be minimum qualifications for a single politician binding a County to a project that will affect a generation of Milwaukee residents. You call this new arena a “public” asset. It would not be a public asset, it would be a private asset heavily supported by public funds where the private owners would have the vast majority (if not the entire) say on usage, concessions, pricing, etc. A public asset would be controlled by the public who would receive direct benefit and have decision-making opportunity in the use of the building, albeit through some type of appointed or elected body. And let’s all think of the long-term precedent here. In 15 years, the Brewers will be back asking for hundreds of millions extensive renovation, expansion or other physical needs to Miller Park that they will deem essential to keeping MLB in Milwaukee. In 35 years it will again be time for the Bucks to come back looking for public investment in the next generation basketball arena, complete with levitating seats with video-on-demand installed. Enough already. I am a sports fan and love watching sports, but there is no need for the public to put this much support and risk into a private entity. Even the questionable loans made to private businesses by WEDC or TIF financing for local businesses don’t come anywhere near the 50% of up-front costs that the public is bearing for this venture, not including the real long-term costs involved in the financing. Bill Sweeney is absolutely right. The super rich owners of the Bucks could do this all on their own. They don’t need the public’s money. This is pocket change for them. If they can make more money elsewhere, let them. That’s capitalism. If some other jurisdiction is foolish enough to give public money to the billionaire owners of the Bucks that is fine with me. At least its not my money. Any politician who supports this plan, including Abele, Barrett and its Republican backers should be thrown out at the next election. It’s time to put a stop to this nonsense. The Democrats ought to recognize this for what it is: a chance to get out of the political wilderness early. Have you never even owned a car? Do you understand what “price discovery” is? Per my 6:45 yesterday, an NBA franchise is only worth what some oligarch’s willing to pay for it. They won’t make the investment if they can’t get welfare. To cover-up that they have no operational assets, the NBA owners love to plant stories such as the one from Forbes. The elephant in the room that you’re missing is that the NBA owners are desperate. They can’t find even one city to even hint at the distant possibility that they might eventually be interested in the Bucks. That could change. All it takes is one politician in one city to make one statement to the press. But, until that happens, Milwaukee’s got major leverage. Kyle, you have slayed the straw man that Milwaukee City & County are the poorest in all the land. Alas, that’s not what I said. As I said earlier, “one of the poorest cities in the state and one of the poorest counties in the state”, if we’re talking money aka median income then Milwaukee County is pretty low especially considering our neighboring counties. If your undies are still in a bunch about what I said, I say deal with reality. The city of Milwaukee is absolutely one of the poorest cities in the state; it’s an odd situation when the wealthiest counties in the metro have all sworn not to subsidize the Bucks but have their elected leaders sticking the poorest in the metro with the bill. Don’t get me wrong, I want the Bucks to stay in the Milwaukee metro but we have to look at who is getting paid by this deal & who is doing the paying. The public/private split of the total seems reasonable if the ancillary development is taxable & stipulated through enforceable contracts. However, the state is walking away with a pile of cash from the added income taxes & Milwaukee county is getting fleeced. How would you feel if the WOW counties were getting this shoved down their throat with added taxes & promises by county leaders to pay extra, just so the state of WI could walk away with 2 sacks of $ instead of just 1? Sykes brought up an interesting point today asking why the public is being asked to invest in a depreciating asset whilst the owners keep the appreciating asset. To point, Herb Kohl’s $18,000,000 investment in the Milwaukee Bucks was turned into $550,000,000. Meanwhile the Bradley Center is now a huge liability if you listen to most people of up to $120,000,000. The BC is only 27 years old and Herb Kohl was trying to get a new arena 10 years ago. In 25 to 30 years another new arena will be needed. Will we be able to locate that one right next to where all this cool new development is supposed to happen? If not, what happens to all of the cool development that will be taking place in the Park East? Will it struggle to make it? I’m glad Bruce is bringing the perspective he is to this as the other media outlets, especially the Business Journal are all in on this. The perspective that you get from them is all business people are behind this when the reality is the ones with a vested interest are. I want the Bucks to stay. I’m a big fan since I was a kid and support them with ticket purchases and merchandise purchases. Having said that I became a Bucks fan at Mecca and a Brewers fan at County Stadium. The 80s were a great time to be a kid and a fan because the games were much more affordable and people were actually into the games then. The Mecca has none of the stuff a new arena does, but it was a great place to watch a game. The NBA is getting a huge TV deal and they just signed a deal to have Nike pay them a billion dollars to put the swoosh on their uniforms. They really don’t need the cash nor do most businesses that get this kind of cash need it, but they may as well ask as long as people are lining up to give it away. @John Casper: Do you think the people of Detroit feel fleeced? Do you think they aren’t happy that the Red Wings are still playing hockey in Detroit? The team is as much an asset as the arena, though possibly even more so, because it allows the city to be represented internationally while also offering a world-class entertainment option. The entertainment aspect must also consider fans that watch games on TV and listen on the radio (which are many); I can only afford to go to a few Bucks games per year, but I watch them on TV probably 75% of the time they play (along with thousands of others that also cannot afford season tickets)–you take that ability away if the team leaves, too. Oh, and I go to the Zoo and Symphony never, but I see great value in there being world class cultural assets like those in my metro area, so I support financing them to enhance the quality of life. The NBA is a franchise and it is seeking to protect its brand–that’s what franchises do, and that’s why they would seek to relocate the Bucks if the team cannot structure a way to enhance it’s playing experience/arena. You are foolish if you don’t think other cities want in (see Oklahoma City and the package it created). To all the points regarding the owners’ likely huge profit on their investment in the Bucks, you do realize they would only get a profit if they sell, right? Assuming they just want to own an NBA team, which by all accounts, that’s why they purchased the Bucks, all they hold is a really valuable asset. They wouldn’t get gobs of cash unless they sold the team; and contractual provisions dictate they cannot move the team out of Milwaukee, which, with a NBA-quality arena in place, ensures Milwaukee will retain the team. Contractual provisions also dictate that, if they sold back to the NBA, they just get their money back. The owners are essentially gifting the Milwaukee area momentum that would not exist without them. Yes, they want to make money and see the opportunity to do so in this City; but they are exerting risk in attempting to do so that no one else in the area was willing to exert. Christ, the team played in London this year and garnered Milwaukee press in England just by virtue of playing basketball there; Milwaukee has a global brand with the Bucks, and I’d think Milwaukee supporters would see that and seek to protect it, especially when the tax deal has no direct impact on individual taxes. @Mike Bark. The 90s/00s were a great time to be a kid and a fan, because, even though the Bucks sucked all but 3 years, kids had NBA basketball to be inspired by. Games weren’t cheap, but we got to go to NBA camps, maybe 1 game a year, watch the Bucks on TV, cheer for the City’s team, etc. Don’t screw the next generation(s) of the Milwaukee area out of fun and exciting things to do and reasons to work and raise families here–especially when it literally does not cost individual tax payers any real tax dollars unless you eat at a restaurant in Milwaukee, stay at a hotel, or rent a car (and that tax already exists); the rest is a state investment. If that were true, I would be all for this. However, the city of Milwaukee looks to have millions into this deal without a firm prospect that the dollars will be recouped through increased property taxes from this development. Then, there’s the highly unlikely scenario that the state of WI will do a better job at collecting Milwaukee county debts than private debt collection services. You don’t think they’re already garnishing tax returns/wages/lottery winnings? Ha! Many people say the state will make savings by cutting the fees to collect these debts.. so you’re saying the private collectors had an even greater incentive to get this money? If Milwaukee county wasn’t on the hook for $4,000,000/year, this might be a good deal for Wisconsin & metro Milwaukee. A partnership of investing public sector tax dollars with private sector investment is what has made Minneapolis a thriving modern city. If progressive voices like Bruce Murphy and conservative voices like Charlie Sykes have their way – Milwaukee will forgo enormous economic opportunities and urban enhancement and unfortunately we will join less successful cities like Des Moines where economic development and the urban experience has yet to be enhanced. James, if “welfare for billionaires,” is a “public sector and “private sector partnership to invest in the economic growth and urban enhancement of the city,” why aren’t Mr. Abele and Gov. Walker advocating for an end to the job-killing-state-regulations against marijuana? I would never encourage anyone to use it, unless they had a serious illness, but the prohibition against alcohol didn’t work either. What better way to jump start urban agriculture than to legalize pot? Like I said, go to Minneapolis and take a look. Then come back to Milwaukee and take a look. Its a world of difference. Which proves that your so-called “smart mayors” are dead wrong. James, and others flogging the lie that there are other cities who want an NBA franchise, where’s your link? What cities, London, Mexico City, Laramie, WY? If the NBA owners can’t create one, it means the Wisconsin taxpayers have more leverage to drive a better bargain. Why aren’t our elected leaders, especially Mr. Abele, using that leverage? I want the Bucks to stay in Milwaukee. For recruiting Marquette needs to play in an NBA venue. If any of the guys getting paid to lobby for “welfare for billionaires” understood the issues, you’d at least mention that. If you (or the people paying you) understood the situation, you’d also mention that Marquette can’t even get Notre Dame on the schedule. Why not bring up how tough it is to sell-out in January and February against no-name schools like Butler and Seton Hall? Here’s a talking point to emphasize. What’s bad for Marquette is bad for Milwaukee. What’s bad for Milwaukee is bad for Wisconsin. I’m a capitalist. I want Edens and Lasry to make money. FWIW, the kinds of salaries it takes to buy Bucks tickets in the lower bowl go overwhelmingly to people who (except for Whitefish Bay, Fox Point, and Bayside) live outside Milwaukee County. My guess is that the Mequon (Ozaukee County) is the city with the most seats in the lower bowl for Bucks and Marquette basketball. But, maybe it’s Brookfield in Waukesha county, or maybe I’m wrong. That data would be helpful, because in order to make money, Edens and Lasry need to fill up that lower bowl. Until those surrounding counties pony-up, ask Mr. Abele to explain why Milwaukee County should? If Edens and Lasry own, or have the controlling interest in the new arena, it’s better for them, for the NBA, for Marquette, and all the politicians connected with this to pay the taxpayers back with interest. Other than sharing ownership, and the profits with the taxpayers, is there another inoculation to prevent the “welfare for billionaires,” label from infecting everyone connected to this? The single biggest opposition the new arena faces is in poor counties in Wisconsin, especially up north. Kyle, are you happy now? Those same counties have prodigious timber reserves. IMHO it’s an enormous, underutilized resource for sustainable economic growth, but that’s another discussion. 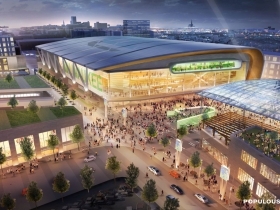 Has anyone on the Abele/Edens/Lasry team considered asking the federal government for funding to prototype Wisconsin wood as a replacement for some (not all or even a majority) of the steel, or other stuff, in the new arena? Upon request, I’m happy to leave links here to companies who claim they can? BMW’s already made a big investment in carbon fiber. It comes from wood. Upon request, link’s available. If folks up north think it’s going to create a few jobs in their county, would they be so dead set against the new arena? If the federally funded prototypes work, and the new arena could provide valuable test data to confirm the manufacturer’s claims, they’re probably “greener” building solutions than what the NBA, NFL, MLB, NHL currently are planning for future projects. Green is the new “chic.” If the NBA, NFL, MLB, NHL all want to take a look, does that free up more federal support? OT, and admittedly very off topic, but since I raised the issue of federal funds for the new arena, I wanted to provide some contest. If you believe Obama and Paul Ryan, and so many other who who lie and say we borrow dollars from China or our grandchildren, you’re a fiscal illiterate, just like Obama, Ryan,…. agree with Wall Street and with what what Beardsley Ruml, Chairman of the Federal Reserve Bank of New York wrote in 1946. “…The necessity for a government to tax in order to maintain both its independence and its solvency is true for state and local governments, but it is not true for a national government. Two changes of the greatest consequence have occurred in the last twenty-five years which have substantially altered the position of the national state with respect to the financing of its current requirements. Since local and state governments don’t issue their own currency, their budgets have to balance, just like a family’s. To put $75 trillion in perspective, US GDP in 2012 was around $16.5 trillion. We blew a lot more than the $6 trillion they’re claiming in Iraq and Afghanistan. Social Security’s Trust Fund is around $2.3 trillion. Bank of America is just one Wall Street bank. They all have derivative exposure. I’ve seen estimates of $700 trillion, but I don’t think anyone knows. It’s that welfare that’s inflating asset prices, stocks, bonds, real estate. If you’re having trouble following, ask your parents, or grandparents about all the cars we had to sell to pay off the FEDERAL debt for World War II. Nope, we didn’t sell any. We paid in soldiers lives, in fuel, in steel, in rubber, …., but we didn’t have to sell any cars. At this point everyone asks about demand-pull inflation, too many dollars chasing too few goods and services. As I mentioned above, when the federal welfare’s going to the elites, all the “self-proclaimed” inflation hawks disappear. “…Demand leakages are unspent income. For a given currency, if any agent doesn’t spend his income, some other agent has to spend more than his income, or that much output doesn’t get sold. So if the non government sectors collectively don’t spend all of their income, it’s up to government to make sure its income is less than its spending, or that much output doesn’t get sold. This translates into what’s commonly called the ‘output gap,’ which is largely a sanitized way of saying unemployment. And with the private sector necessarily pro cyclical, the (whopping) private sector spending gap in this economy can only be filled with by government via either a (whopping) tax cut and/or spending increase (depending on one’s politics). As long as a debt is denominated in dollars, the U.S. government can always pay it. If the U.S. wants to borrow in some other currency, or commodity, all bets are off. The next time you get a paycheck, look to see how much is coming out via the payroll tax, FICA. In addition, consider how “depressing” federal income and corporate taxes are on consumer demand. The real “job creators” are consumers with money to spend. There are lots of things we can run out of. Clean air, water, safe food, sustainable energy, some metals and minerals. @John Casper You should forward that 5 year old link to Greece. Observer, which link do you consider five-years old? Learn capitalism 101: Spending = Income. Where’s your defense of all that federal welfare for Wall Street and the elites? Absent that, how do you explain the asset inflation in stocks, bonds, and real estate? That link’s from May 2015. Is that recent enough for you? Can’t thank you enough for mentioning Greece. You made my point. Dependent on the Euro, Greece mirrors the fiscal dependence of all 50 U.S. states on the dollar. Since you’re a fiscal illiterate, what are the chances you’re equally clueless about how likely it is that Greece/Germany can start a process that really hurts Wisconsin exports? Doesn’t Grexit, or a collapse into anarchy/failed state, weaken the Euro against the dollar? After Greece’s collapse, aren’t Spain and Italy next? Doesn’t that set-up a scenario that orbits the value of the dollar against the Euro and probably all other currencies? Doesn’t that further crush Wisconsin exports? Doesn’t that make imports cheaper which only increases our trade imbalance? Japan’s debt to GDP ratio is a lot worse than Greece. Why aren’t they in default? Where’s your link to all the cars we sold to pay for World War II? The dollar, or any currency that’s off the gold standard, is like points on the electronic scoreboards at Lambeau. We’re not going to run out of them. That’s how most money is created, electronically. A very low percentage is in circulation is in paper or coin. Currency is a unit of measure. Nobody’s afraid that making more rulers is going to cause a shortage of inches, or centimeters, or feet. I’m sorry you support higher federal taxes. When the federal government quits crushing demand, it puts people back to work. It’s those increased earnings that allow states and local governments to tax. That’s the only way they can repair their budgets. FWIW, I favor high federal and state tax rates on the elites, the .00001%, not doctors, lawyers, …., others whose annual incomes are under $20,000,000. It’s not that the federal government needs that revenue, they don’t. It’s that without that those federal taxes, the elites will continue to buy both parties and destroy capitalism. Being rich isn’t fun if you spend all your time behind payed bodyguards hoping you or your kids aren’t kidnapped. That’s the future the elites are creating for themselves. Since it sounds like you lead conservative, imho he might be a good place for you to start. There’s nothing “fiscally conservative” about unemployment or poverty. My guess is we agree that the only thing that leads to wealth creation are productivity improvements; that people who drive productivity increases deserve to be rewarded, that a fair meritocracy really, really matters. IMHO, the vast majority of human progress is incremental, occurs very slowly, over a long period of time, the gradual evolution of the automobile. Genius, such as a Galileo, Einstein…. are the incredibly rare exception. IMHO, the Ruml/Mosler/MMT fiscal insights are just such an exception. Observer, has something changed where Greece can now issue Euros? Last I heard, it can issue them as well as the state of Kansas can print dollars. Maybe you should read up on Fiat Money & Optimum Currency Area before you try to drag Greece in the conversation. Taxes For Revenue Are Obsolete Posted: 06/18/2010 5:12 am EDT Huffington Post, an opinion piece written by the owner of a fixed income fund. Or your Wall Street Journal opinion piece written by a honcho at Morgan Stanley. Are your heroes always connected to those in industries that caused our crash? How about Paul Krugman arguing that our Fed did the right thing as opposed to the European Central Bank that Greece must answer to. http://www.nytimes.com/2014/11/24/opinion/paul-krugman-the-inflation-and-rising-interest-rates-that-never-showed-up.html?_r=0 And Tim, I thought John was talking about our country that no longer needed to collect business taxes. Which is why I mentioned Greece and how this post from John might work over there. Greece may well be without a Euro in its future. Fiat money is something my libertarian friends decry when pining about the gold standard. And I’m not sure where this has to do with the Bucks and capitalists being capitalists and taking the risk of using their own money to increase their capital. I prefer to see them remain pure capitalists (and your idols) unsullied by any hint of government money. I dont see a greater economic impact -or team -after our last billion-dollar-baby …Miller Park. It’s a giant steel bear trap and too late for taxpayers to gnaw their paws off now that were even paying for perpetual maintenance and groundskeeping . Since Mosler’s article will be five-years old for another two-days, it should be easy for you to something wrong with it. Please list the most serious failings. Yes, Mosler’s a hero, imho. Glad to learn of your mistrust of Wall Street. IMHO it’s important to separate the Wall Street CEO’s, who are the worst, from a lot of others who work at lower levels in the financial markets, who understand that the lack of fairness and transparency threatens the equity market’s very existence. Is there a presidential candidate more likely than Sen. Sanders to hold Wall Street CEO’s and the elites accountable? If not from Wall Street experts, where do you get reliable information on the financial markets? The author of that blog is (or was) president of the Society of Libertarian Entrepreneurs. That is all. If you had any “suspicions,” you’d be coming up with all the other cities that want an NBA franchise. How’s that coming? Until another city wants the Bucks, Milwaukee has leverage. Why isn’t Mr. Abele using that leverage to negotiate a better deal? Conan’s an Austrian economist. The Rogoff-Reinhart data scandal in 2013 undermined all their positions. Rather than focusing on that, or Conan’s operational ignorance about the Federal Reserve and Treasury, just post that link about all the cars we sold to pay for World War II. If we didn’t sell cars to pay for World War II, how did we pay down that debt? If we didn’t pay it down, do we still owe it? To whom should we write the check? Don’t a lot of cities want an NBA franchise? I know Seattle and Las Vegas do for sure. I’m sure there are many others. Hopefully Palley is an accomplished enough source for your educated palate. Our biggest leverage is simple. This toy is their big chance to be somebody. I know lots of people have made lots of money and no one knows who they are. They were never star athletes etc, so this is their baby. if the contract is true, then if this is not built they will lose their franchise and just become ordinary rich people who no one knows. That is not something they want. I’m sure all 4 of us will find this interesting. I’m sure setting the speed limit at 30 will find immediate acceptance. Now can we go back to commenting on how “How Abele Bailed Out Walker”? Seattle is the obvious one. They had a team for 41 years. They have a billionaire and an agreement with the city for an arena that lasts until 2017. They would have it now if the league hadn’t meddled to keep Sacramento in place (according to Seattle’s version of events, at least). Las Vegas wants one, but none of the major leagues seem all that eager to link that closely to gambling or a fan base that would be easy to overwhelm with road team fans.money to solve this problem, nor can the state. If the sale of cars after World War II can fund this arena, then great, but I’m not going to defend Conan for being Austrian because other people were Austrian too. MMT has flaws, but I doubt you’ll be able to see them regardless of the case presented. Las Vegas wants one, but none of the major leagues seem all that eager to link that closely to gambling or a fan base that would be easy to overwhelm with road team fans. John, the counter-arguments to the counter-arguments continue on for farther than I’m willing to debate. Milwaukee County cannot print money to solve this problem, nor can the state. If the sale of cars after World War II can fund this arena, then great, but I’m not going to defend Conan for being Austrian because other people were Austrian too. MMT has flaws, but I doubt you’ll be able to see them regardless of the case presented. You’re way too much fun. If Seattle wants an NBA franchise, why not the Atlanta Hawks? Per the link, they’re up for sale. I know the owner says he won’t sell to another city, but if that’s really the case, why can’t the NBA make the same accommodation for the Bucks? Why are we being held hostage to the threat that the Bucks will leave, if the taxpayers don’t pony-up? Per the link, if Seattle wants a franchise, why didn’t they buy the Timberwolves when Glen Taylor had them up for sale? Isn’t the real reason that Taylor “has since given up that pursuit,” because no city in the world wanted and NBA franchise? NBA owners don’t want the value of their investment diluted. Since they can’t get the price/welfare package from the state and local government, that they want, they’re standing pat. IMHO, Taylor’s eager to sell. But, he and the other NBA owners understand that his eagerness just drives down the price and that hurts all of them. All it takes is one billionaire and one city to take the leverage away from Milwaukee. Let’s use the leverage while we’ve got it; extract better terms from the NBA, Mr. Edens, and Mr. Lasry. ROBERT MURPHY, Ph.D, is a Senior Economist with the Institute for Energy Research and an Associated Scholar at the Ludwig von Mises Institute, where he teaches at the Mises Academy. He is also an adjunct scholar at the Mackinac Center for Public Policy. From 2003 until 2006, Murphy was Visiting Assistant Professor of Economics at Hillsdale College in Michigan, U.S. From 2006 until early 2007, he was employed as a research and portfolio analyst with Laffer Associates, an economic and investment consultancy in New York. He runs the blog Free Advice (http://consultingbyrpm.com/blog) and writes a column for Townhall.com and has also written for LewRockwell.com. He is the author of a number of books including The Politically Incorrect Guide to Capitalism and Lessons for the Young Economist. I enjoyed it, I think a lot of the content is excellent, but it’s long, just under two-hours. There’s a lot of common ground that they agree on and no “gotcha” moments. Let’s turn to your buddy Palley, who you appear not to have read. From page-five of your link. Then Palley “steps in it,” at the bottom of page-8. Now do you understand why Palley never mentions Japan? is under 50-minutes and very accessible. Why not adopt Mosler’s federally funded health care plan? That’s what’s known as “single-payer.” It’s not socialized health care. Physicians, hospitals, nurses, allied health professionals, Big Pharma, and medical device makers, those groups that actually provide care to patients, still compete with each other. The big loser in Mosler’s plan is the for-profit health insurance oligopoly, who no longer provides any value. With a robust single-payer in place, corporations can compete on their core competencies, not how well they manage health care costs. Why not a federal job guarantee? Do you want invest in education? Do you want to keep kids in school? Pick a number. I’ll ball-park it at $110,000. With their diploma at graduation, every high school student gets a one-time check for $110,000. It’s a free country. The grad can blow all or part of it. The hope is that most will use it to pay for college, or to further their education in some way. That “stimulus” is fair. It’s not means-tested. The funds belong to them. They can spend it however they please. IMHO, that would jump-start hiring in colleges and universities. Because more kids could afford college, we’d need a lot more teachers. According to the IMF, fossil fuels world-wide annually get $5.3 trillion in subsidies. Why not federal subsidies solar, wind, biomass, smart grids to replace our decrepit electricity infrastructure? You may be familiar with former Washington Post reporter, Tom Edsall, who is now with the New York Times. In the link below, he’s moderating another Modern Monetary Theory conference with Mr. Mosler and Dr. Kelton. Carney moderated the Mosler Murphy debate. Thanks for bringing up that Mosler’s a gear-head and a green. “In 1985 one of the most groundbreaking designs in automotive history went into production – the Consulier GTP, the first production car with no structural metal. Weighing in at 1900lbs and using only a Turbocharged 2.2 liter Chrysler engine with 175hp, the GTP ran circles around most sport cars of the time which prompted the company to take it racing. Waukesha is a giant leech on the city of Milwaukee. I don’t see why Walker Supporters and so called conservatives have any issue with tax payer money going to wealthy private enterprise. WEDC under Walker gave out 124 million without proper oversight and review, among other loans and huge tax breaks to the wealthy. So WCJ what’s the real reason your against public funding for this corporate welfare?